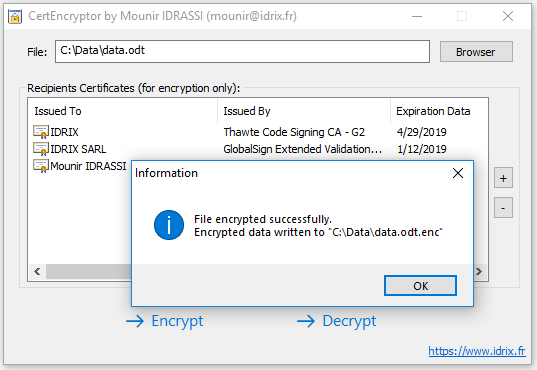 CertEncryptor is a Windows application that enables encrypting and decrypting files using existing digital certificates. The encryption uses AES 256-bit and the data is encrypted following the Cryptographic Message Syntax (CMS) standard. It allows encrypting files for an unlimited numbers of recipients, each recipient being identified by a standard X509 digital certificate (either RSA or Elliptic Curve). File decryption requires the presence of the private key associated with one of the certificates used for the encryption. The maximum file size allowed by this tool is 100 MB per file. You can contact us if you need a version of this tool with an unlimited file size. A screenshot of CertEncryptor is available here.